Sailing south from Mexico to Panama a boat has to pass three hairy spots where the wind can be fierce. These are areas where the trade winds from the Caribbean blow across the narrow Central America isthmus and accelerate as they are funneled through mountain valleys. The first such place is the Gulf of Tehuantepec. We crossed this 250 mile stretch of water with little difficulty. The second are the Papagayo winds that blow along the coast from El Salvador to northern Costa Rica, but are strongest on Nicaragua’s’ Pacific coast. 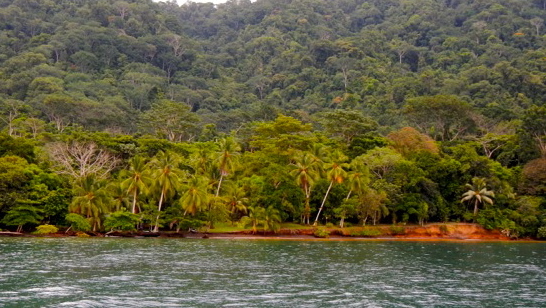 The third is the Gulf of Panama which we will face on our way to the canal. We crossed the second of these most recently. We left El Salvador with a good weather window but quickly ran into a steady 20 knots of wind on the nose. The strategy for navigating these winds is to stay very close to shore. Since the winds blow from the land, staying close to land gives little room (fetch, in sailing terminology) for the winds to build up waves. Dealing with a lot of wind is one thing, dealing with a lot of wind and big waves is another, and one we try not to face. So hugging the shore and passing along the barren shores of El Salvador and Nicaragua, we, along with our buddy boat Mermaid, sailed into this stuff hour after hour. Finally, as dark was setting in on the second night, we had had enough and looked for a bay to wait it out (these winds can blow even harder after dark). We pulled into Astillera in Nicaragua, a largely empty bay, to anchor overnight. The winds howled all night but we slept well in the shelter of this remote bay. The next morning, we were greeted by a stern young man from the Nicaraguan navy on our stern. He asked what we were doing here and to see our papers. Neko being boarded by the Nicaraguan navy. Satisfied that we were leaving in an hour and were only there to wait out the wind, he went over to inspect Mermaid. Frankly, I was pleasantly surprised that we didn’t have to pay any “fees” or “fines”. With no choice but to leave, we went out into more wind than the day before. That day we had a blistering sail with gusts to 45. With 2 reefs in the main and the staysail up, we hit speeds up to 11 knots. We hugged the coast and with the wind more to the side of the boat, the sailing was easier. We flew down the coast of Nicaragua, past our last intended “bailout” bay and into the relative safety of Costa Rica. 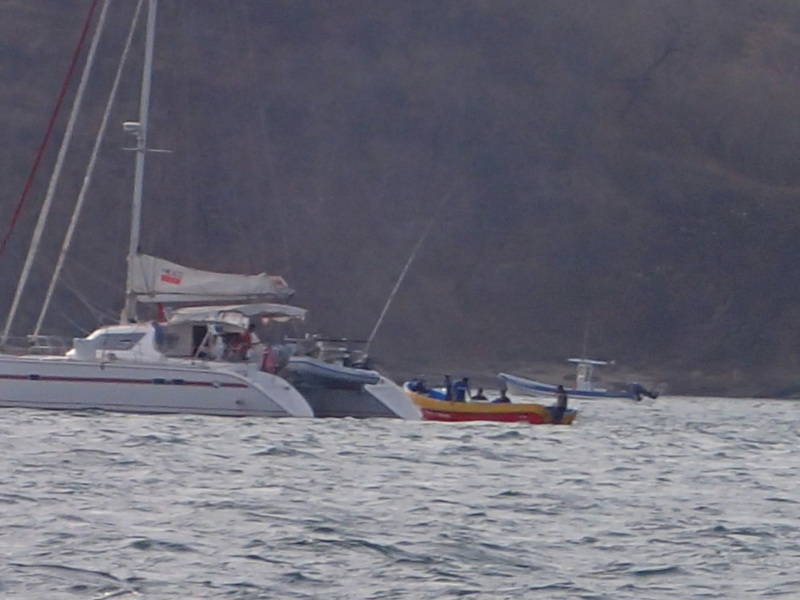 By the end of the day the Papagayo winds had slowed down, and we coasted into an anchorage tired and exhilarated. Now we can slow down and sight-see a bit (off to the Monteverde cloud forest). This entry was posted in Boat Stuff, Sailing and tagged Tehuantepec by Pete. Bookmark the permalink. Glad to hear that you made it through. Great heads up for us for later in the year. We’ll keep that little bay in mind if we experience the same thing. Enjoy your travels through Costa Rica. Whew! I felt I was with you as the winds pick up speed and so happy to know you made the second of your challenges safely. Wow! What an adventure! How’s Lucy taking taking all this big wind and surfing? Glad you are all well and having a “blast”! Ha. We are back in PV for the summer. Hi Uncle Bob, glad you are following along. We are looking forward to exploring Panama. I am just starting on The Path Between the Seas, about the building of the Canal. Its fascinating. I hope you’re wearing your seat belts. Love to you both.